Cardinal Path, Wistia, Moz, and Uberflip all want to send YOU to Call To Action Conference on Friday, September 12th. 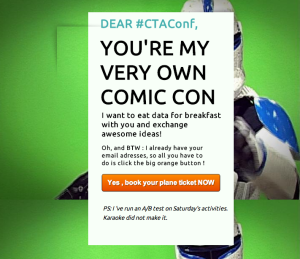 Tweet your awesome landing page with the hashtag #CTAConf and tell @CardinalPath @Wistia @moz and @UberFlip how much you love them. Stef’s page is simple, clever and to-the-point. In the contest’s finer details we told you that your landing page doesn’t have to be all bells and whistles. Just tell us why you want to come, plain & simple. Sophie’s landing page is also exactly what we are looking for: a couple sentences on why you want to go to CTAConf. Oh – and Sophie wants to come all the way from France? Now that’s dedication. 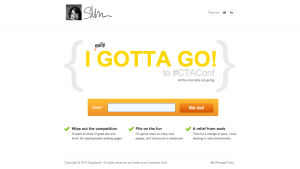 So there you have it: 3 awesome landing pages examples to give you inspiration to score you a ticket to Unbounce’s Call To Action Conference this September. You have until Wednesday, August 27th at 5:00 pm PDT to tweet us your page and we’ll announce the winners shortly after. PSS – Cardinal Path has a couple in-person surprises for attendees at the conference too! Which gives you all the more reason to submit a rockstar landing page and attend.